The world's grooviest live disco & funk show. Playing all your favorite classic 70's & 80's disco hits. 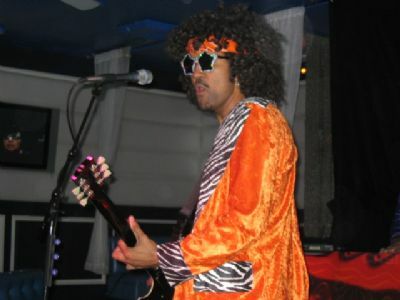 There are many disco cover bands out there, but none with the flair, soul, and non-stop charisma of THE FUNKY HIPPEEZ. This Los Angeles based band has entertained audiences from as intimate as a 100 guests to over 600,000 for the Lakers Victory Parade at the Staple Center in LA. They have been seen on television and have played numerous movie premier parties, corporate events, weddings and private parties. NEWS FLASH! THE FUNKY HIPPEEZ original 70's disco song 'FOXY MAMMA' is currently being used for the television and radio trailers for the 2004 Movie 'BARBER SHOP 2'. Bazyle was amazing to work with. He represented the Funky Hippeez professionally from beginning to end! Each member of The Funky Hippeez were full of talent and personality - - making our event a great success and made me look good! They definitely kept our crowd/guest entertained the entire evening. Even on their breaks - they had a DJ to entertain us. I would not hesitate booking them! Thank you, Lani, it was equally a pleasure to entertain your group and have the opportunity to work together. A Themed Event always encourages the guests to let loose and have a great time. We look forward to your next event. 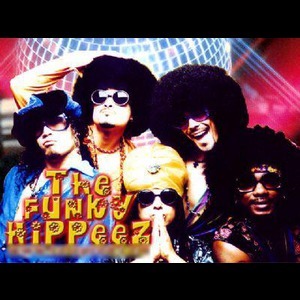 This is the singular best band I've hired in all my years booking bands for corporate events.The Funky Hippeez performed for 2,000 people at our Las Vegas conference during the International Franchise Associations event. 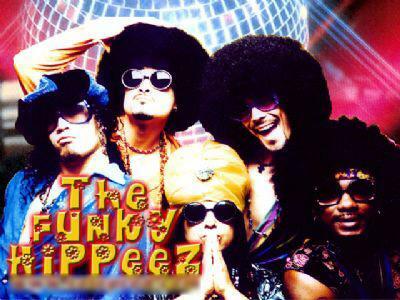 The Funky Hippeez immediately won over the audience with their embodiment of the entire catalogue of #1 Disco and Funk music throughout the '70's. Everyone was immediately on their feet packing the dance floor. The "Solid Gold Dancers" helped to take their show beyond any other event we've held to date. Our guests will be talking about this event for years to come. Thank you Keith, it was an amazing event and a pleasure entertaining your group! We look forward to your next event, and possibly bringing our 80s theme show to you next year! The level of professionalism, easy of business and talent of The Funky Hippeez was awesome. The kept the dance floor packed all night. Great Disco band! They were amazing! They were a super fun, huge additon to our Wedding and we are so happy that we hired them! We just had our wedding last Saturday (June 24) and were looking to provide a fun, party atmosphere for our guests. The Hippeez were off the hook!!! I had seen them before at bars so I was not surprised but if you want your guests to stay on the dance floor the entire reception these are your guys. They also did some cool and unique things that personalized the performance and were just incredible. I am sure that in the future I will throw some kind of party where I need a band and I would not hesitate to book The Hippeez again...they are true professionals. If you want all of your guests approaching you to find out where you found such an incredible band, book 'em. Wayne C.
Please note The Funky Hippeez will also travel to Norco, Riverside, Mira Loma, Yorba Linda, Anaheim, Orange, Rubidoux, Silverado, Chino, Ontario, Chino Hills, Fontana, Brea, Guasti, Lake Forest, Trabuco Canyon, Villa Park, Atwood, Irvine, Montclair, Pomona, Rancho Cucamonga, Rancho Santa Margarita, Santa Ana, Bloomington, Diamond Bar, Lake Elsinore, Placentia, Tustin, Upland.